Lagoon was founded in 1984 as a subsidiary of Jeanneau Technologies but today Lagoon boats belong to CNB that belongs to the Group Beneteau. 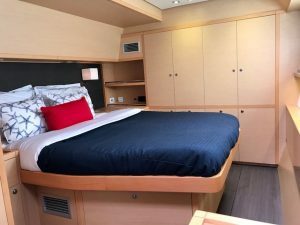 The beginner models of Catamaran were developed for private cruising but a second generation was brought to the market from 1996 to offer more space and comfort. Lagoon 60 is one of them. Lagoon took over the market leadership in cruising catamarans in 2003. It is today known as the world’s third largest shipyard for sailboats and the largest catamaran shipyard. We did bedding for this lagoon 60 providing them with duvet covers in Sunbrella backed in our 600 thread count Egyptian Cotton sheeting for comfort. A classic and timeless look in navy’s and red and crisp white. Our 600 Thread Count sheets are available in many colors and custom fit for your yacht mattress configuration. Each set includes a flat sheet, fitted sheet with matching pillowcases. We have a few options when it comes to sheeting. You can have the 600tc sheeting in stripes or solid with almost 16 different colors to choose from. We also carry Bamboo sheets, ideal for a marine environment. They are not only environmentally friendly, they regulate body heat like no other, keeping you comfortable in all temperatures. Bamboo is one of the softest fabrics available & is mold and mildew resistant, grown without pesticides & are great for people with allergies & chemical sensitivity. If you have a unique taste in bedlinens then our Sferra collection is for you. There is nothing better than a cool, crisp feeling of bedlinens woven in a simple, plain weave style. Visit our website to check out our entire Sferra collection. Our custom duvet covers bring the perfect amount of color and comfort to your stateroom when combine with our sheeting. 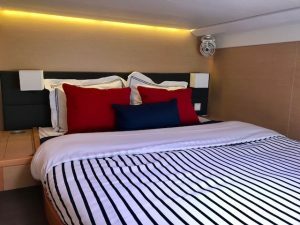 Whether it’s a solid 600tc duvet or a bamboo duvet, each is made custom fit for your specific boat. Our customer here seemed very satisfied with this beautiful bedding. 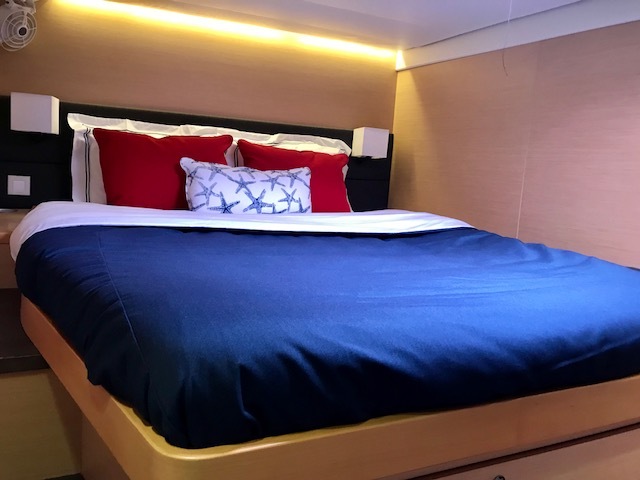 By using the two all-time favorite complement hues, red and navy in solids and stripes with just the right amount of white are giving these staterooms a perfect classic look! Give us a call or visit our website and we will be delighted to help you create the bedding of your dreams.